I don’t know how long it has been since I have seen any Shakespeare and now I have just been twice in the last week! First was to see the Globe to Globe production of Hamlet – this is a two year world tour from the Globe theatre company taking Hamlet to every country in the world! The show was preformed in the Azerbaijan State National Drama Theatre, which is an impressive building and a grand auditorium. The show is a quick moving adaptation with the cast providing all the music and set changes (which were minimum) and several actors playing several parts. It shows the skill of the director and actors that this wasn’t confusing and it was always clear who they were playing. I went with a group of friends and we were seated right up in the Gods (auditorium 2) the view was slightly obscured by a random safety pole but there was no problem hearing anything. There was a bit of fun when the lady next to us had a toy gun on the floor next to her feet, it wasn’t immediately obvious that it was a toy which caused a few raised eye-brows. You can just see the toy gun on the floor. The second Shakespeare was Midsummer’s Nights Dream by TISA high school, I took Katrine to this as her first experience of Shakespeare. It used rock songs though out the play, preformed by some of the actors as well as additional musicians, which tied into the plot really well. It felt a bit gimmicky at first but it was used to great effect and made the flow of the story work very well. It also helped identify the fairy characters and the humans and they danced to the music differently, which helped the understanding of this very complicated plot. Katrine got the main bits, I was impressed with her following the story. It was a very enjoyable night and didn’t feel like a school production. They are taking the show on an European tour in November! I seem to spend a lot of my time hunting around for various bits and bobs that either I, or my children need or things for Guides, which I am often not looking to use for their original purpose which can make disturbing the items harder. 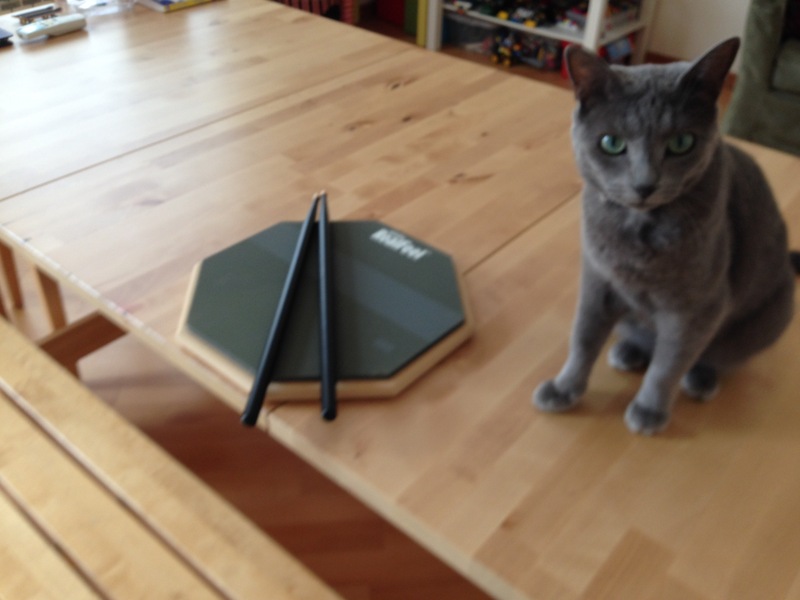 A practise drum pad for Gregor, he has just started drum lessons, from the TISA music academy. He wants to get a full drum kit straight away but we want to a) protect our ears as long as we can and b) see that he really wants to learn to play the drums and will practise. This was probably the hardest item to find this week, but we eventually tracked one down in a music shop in the Baku Outlet Mall (at the bus station). Electra just fancied being in the photo. A cheap keyboard, Katrine and I have started singing lessons, so I need something to be able to tap out the tune and rhythm to sing to. I don’t need anything fancy or particularly good, so I’m happy with this. It cost 70azn (£43 at today’s exchange rate), from a music shop in Sederek (row 12). Cheap and cheerful and does the job. 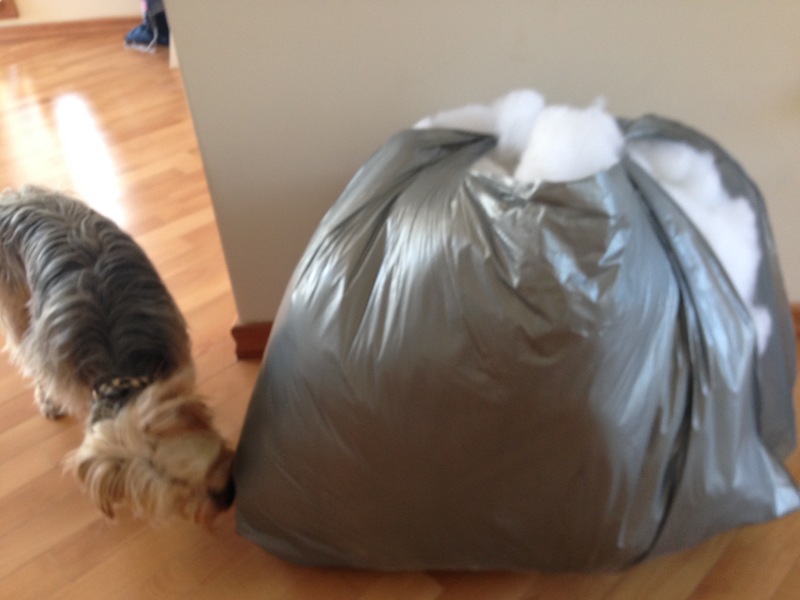 A giant bag of polyester stuffing. This is to make Liquorice a dog bed (which he is currently using curled up at my feet). Katrine made herself some curtains – well she got some ikea curtains, cut them to size and added heading tape, which I count as making curtains. Which left a large bit of material left over, just perfect for a dog bed. Here is the finished article and the dog being very happy sleeping on it. 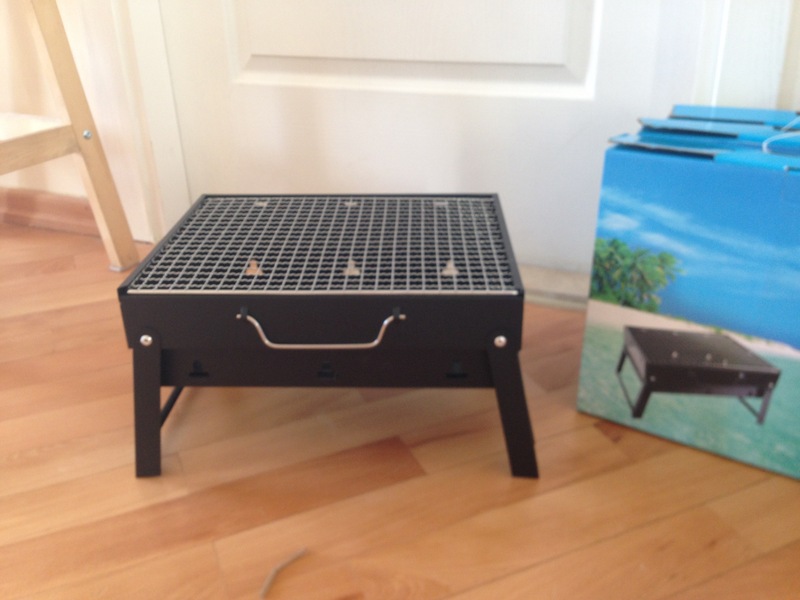 4 mini BBQs for my Guide unit. We are going to have a fire skills meeting (we are thrown out of our regular meeting place for a week as there is a volleyball tournament), the girls will have to light their our fires in small groups with no firelighters or starter fluid. They will then toast their marshmallows to make s’mores. 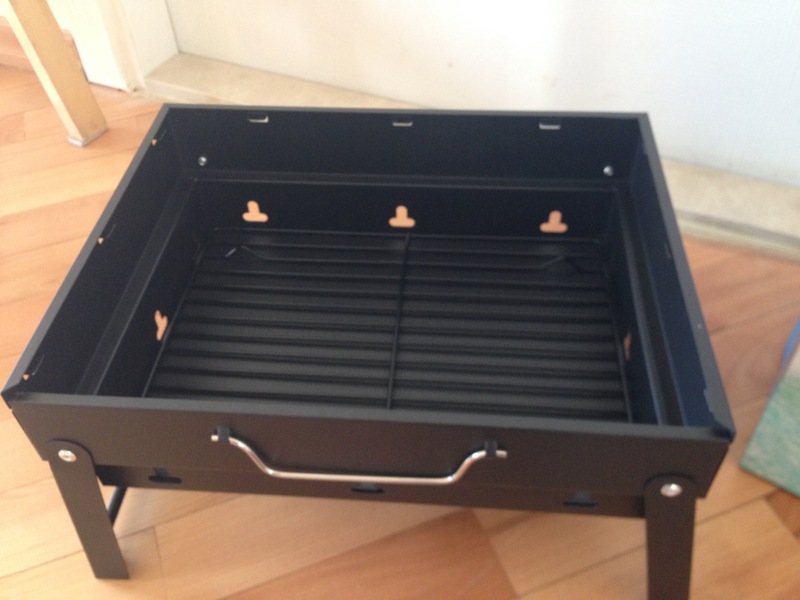 Plus we can use this to cook on when we camp in the summer. The traditional photo of the first day of the new school year. (2014, 2013, 2012 can be found here). The second is a milestone for Gregor, this year is the first year that he has returned to the same school after the summer holidays. The longest he has done at a school previously was 1 year, the shortest 8 weeks. 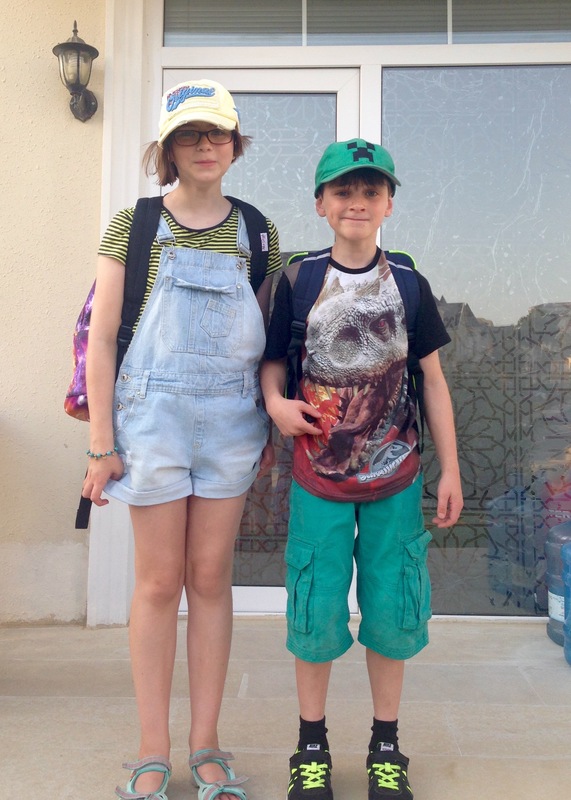 He is going into P7 (England – year 5, Scotland P5, other places -Grade 4) and TISA is his 6th school. 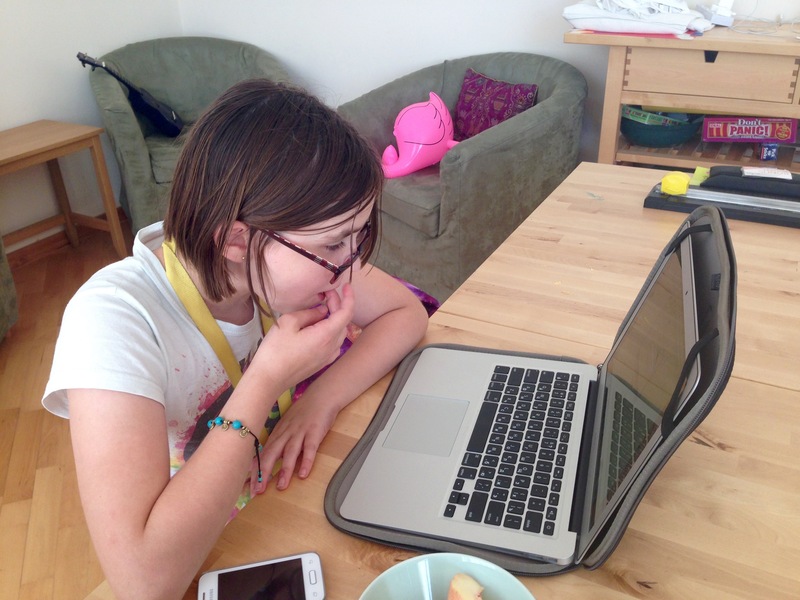 TISA is a 1:1 macbook school, all students in upper Primary, Middle and High school have their own allocated laptop, either a Macbook pro or a Macbook air. Students in upper Primary have to keep their laptops in school. Wow, that was a very long blog break. My last post was right back at the beginning of April, that seems a lot longer ago that just 41/2 months, a lot has happened. 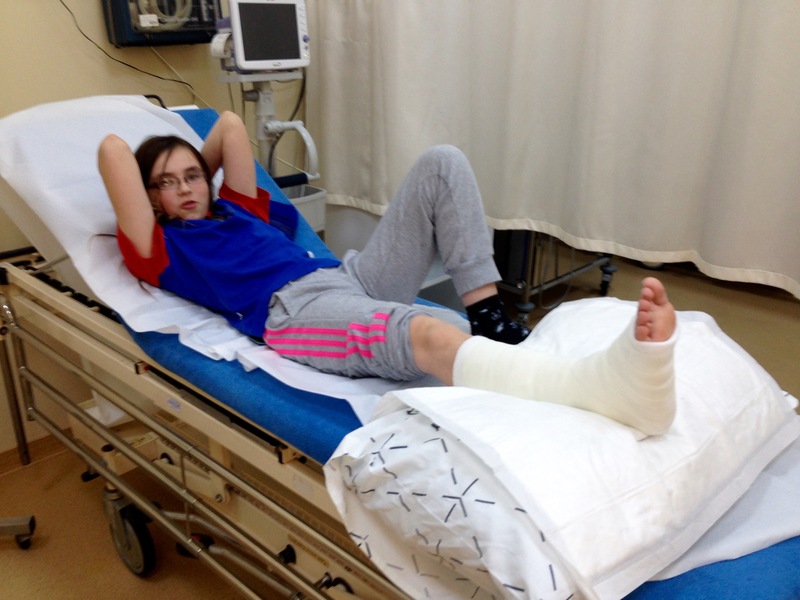 Katrine fell off a trampoline at the end of March and hurt her right ankle. Being kind parents, and a Sunday on a holiday weekend, we waited until the next day to pop her along to international SOS (iSOS) clinic in Baku. Given she couldn’t move her foot and was in a lot of pain they called the radiographer in on her day off to X-ray it. No broken bones, so just home continue with RICE and she should start to walk on it within a few days. Week later, she still couldn’t put it down so back to see the Doctor. Suspects it might be soft tissue damage but as it is causing her a lot of pain we were sent to have an MRI to check it out. We got the appointment for the next day so toddled off to the hospital, we had a guarantee of payment from iSOS, I took Turan my diver in with me to translate, which makes it a lot easier to find out way around. So an hour of lying still (very hard work for a Katrine) with me perched on the steps and the MRI was done. The result – slight swelling of the ligaments but nothing major. So the next step is some physio. The physio was very gentle but even this caused a huge amount of pain. 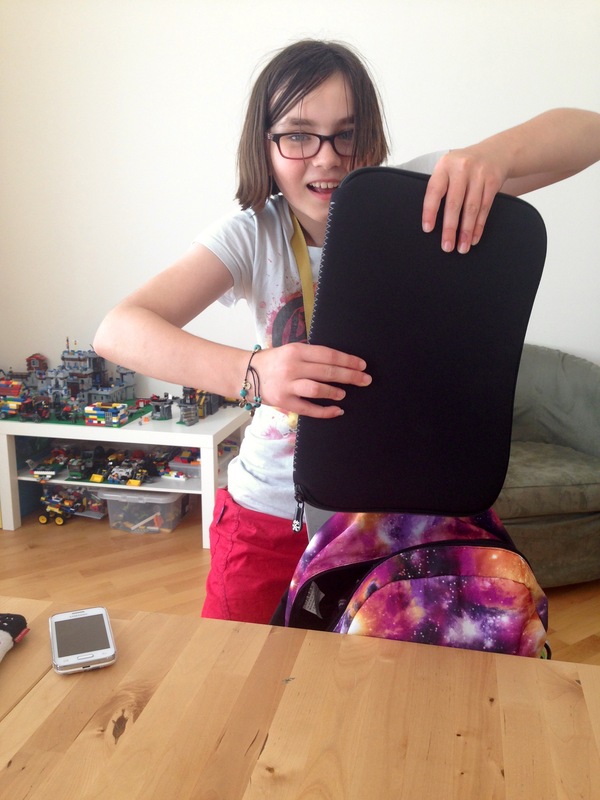 We came home at lunch time but Katrine was in far too much pain to make it into school. We were supposed to do some daily exercise but it just wasn’t possible, so back to the doctors. This is now getting slightly puzzling, no breaks on the X-ray, nothing showing up on the MRI it had now been 3 weeks but still very high levels of pain and no movement of the foot at all, certainly not weight bearing. So we get referred to an orthopaedic specialist, who after examining Katrine and the X-rays and MRIs, decides that is a Salter-Harris Fracture Type I, which is a complete fracture at the growth plate, as the growth plate shows up lighter on X-rays anyway it can be very hard to see. He recommended immobilising the ankle using a medical boot. Good news, so we go back to the iSOS clinic for them to fit the boot. Cue screaming in pain as this is obviously agony for Katrine – apologies to anyone in the waiting room that day. After making sure that she had the full dosage of paracetamol and ibuprofen and some hot chocolate and cartoon network, they tried again. Nope, same result. Which only left the option of a hard cast. Surprisingly this did not give Katrine a lot of pain, no idea why the boot was painful and the cast not but hey ho, pain doesn’t always make sense. Here she is, in her Guide uniform. She even went to Guides straight from getting her leg plastered up. Unfortunately, having her leg in plaster did not stop her ankle from hurting, which didn’t leave the doctors with many more options available in country and we were told that we would need to be medically repatriated, fancy way of saying being sent home. We then fly back to London so see an ankle paediatric specialist, who first thing orders a new set of MRI images. He did not this it was a Salter-Harris fracture but that she has probably over stretched the nerve and referred us to 2 new specialist – a pain consultant and a specialist pain physio. He also took the hard cast off and put a medical boot on, this time no screaming in pain! We now had a diagnosis of Complex Regional Pain Syndrome. And so started a very long slog of seeing the physio twice a week and the pain consultant once, she was on a cocktail of medicines to try and alleviate the pain – never successfully, this was the hardest part for me, seeing Katrine always in pain. The exercises with the physio were to desensitise Katrine’s foot and leg (at this point the pain had spread upward so it reached the knee – something I learnt, pain spreads if it is persists!) and for Katrine to reconnect with her foot. She was saying that she only had 1 leg, that the other was an alien or robotic leg that had just been attached to her knee. This is quite common for people with chronic pain. We did a lot of mirror therapy, where she could see her left foot and its reflexion, which looked like her right foot, moving in a normal way. We also had to talk about her foot and other people’s feet, counting her toes. And we also worked on breathing and relaxation techniques as pain and stress are very closely interlinked. After what seemed like forever but was only 2 months, Katrine moved her foot. At first it was just her big toe and then the next week she could flex her ankle a little. And then the breakthrough, she put her foot on the floor. From then on her recovery speeded up dramatically, first one step, then 2 and in three days she was walking. So then it was re-buidling the strength and regaining her sense of balance and control. And since she has recovered so well we have been able to return to Baku. The medical staff we have dealt with have been amazing, both here in Azerbaijan and in the UK. International SOS supported us thought our time in the UK, following up the appointments with phone calls and being available for me to call if I had any problems or concerns. There is a new museum there which has some great interactive exhibits and information (in both Azeri and English). Both Katrine and Gregor really enjoyed the museum and picked up quite a bit about the chaining landscape and the different ages of the paintings. After a toilet stop (clean and with toilet paper which is always a major plus) we got back into the car to head up into the mountains to the site of the actual caves. There are loads of carvings to see (they are numbered) and rocks to scramble over and the pictures are very clear and it was great fun to recognise the images from the museum and figure out what the story they are saying. The last picture shows Katrine playing a carved rock which plays a slightly different tone depending on where you strike it. For the second half of our adventure we headed a bit further south to see the mud volcanos. Baku cats and other random photos. Here are some photos that just didn’t really fit into the previous blog post. 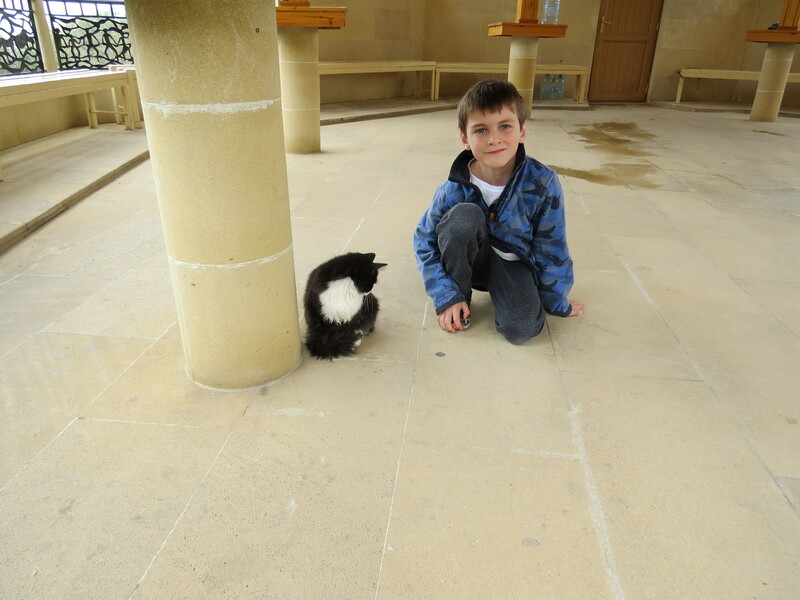 Plus pictures of Baku cats, can’t resist. 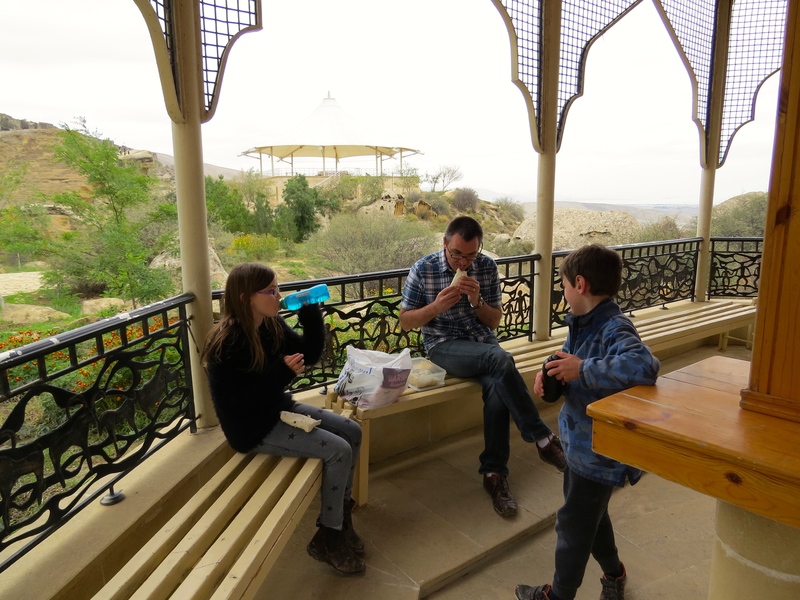 We are due to move to Baku in January 2014 so we have come over to Baku for a recce (short for reconnaissance) trip. We lived in Baku from 2003-2006 so it has been very interesting to see how much has changed and what has stayed the same. Lots of new buildings and the infrastructure seems improved but the traffic is as manic as ever. So far we have looked round the old city, the school and the medical facilities. All looks very good, the fantastic weather certainly helps! The International School of Azerbaijan, TISA, is an IB school following the primary years program, which is the same as in Korea, so the transition should be smooth and we all like this style of teaching. The year numbering had me confused for a while, Katrine will be going into P7 and Gregor into P5, two numbers higher than their years in England. The houses are next to the school in Stonepay, or Royal Park – which is the name on the entrance but no-one calls it that. They seem good, spacious 4 bedroom houses, if a bit crammed in. The major problem is that there might be a waiting list up to 9 months, but you won’t know if there is a wait until you actually get into country. I forgot to take my camera with me, so no photos of the school or houses. But I did get plenty of photos of the old city and on our city tour. Our hotel, the Hilton, this used to be the Azerbaijani when we last here. Fountain square. Managed to walk here without getting lost, which after 7.5 years I was pretty pleased with. At the start of our city tour, outside a Turkish Mosque. Admiring the view over the city. Exploring a 700 year old caveranserai. Checking out the prehistory relics near maiden tower. One of the small streets in the old city.